Baby Lips has launched a new range of lip balms called the Baby Lips Candy Wow range to make your winter exciting and fun. Baby Lips has moved beyond the basic lip balm stick and now comes in the form of a crayon pen! Enriched with Vitamin E, this chubby stick will help you wow your lips in 5 candy shades - Raspberry, Mixed Berry, Orange, Cherry and Peach. Now take intense care of your lips this Winter and pop them with a dash of color with the fun and sweetness of a candy. As I said already it is like a crayon colour pencil packaging with twist up for use and twist down to close like packaging. So it is easy to use, it is travel and user friendly. Still I personally feel the lip balm should go fully inside when twist down, but not a big issue. The shades I got for review are Raspberry and Peach. Raspberry is a pink shade which is suitable for all skin tone. It looks beautiful on my lips. I have medium skin tone and this shade goes well with my skin tone. It looks more like a sheer pink lipstick and looks good on lips. The Peach is a pale pink shade with frosty look and I am sure it will not suits for Indian skin tones unless you have pink lips, this shade is more on pale side and may not liked by most of the medium skin tone people. 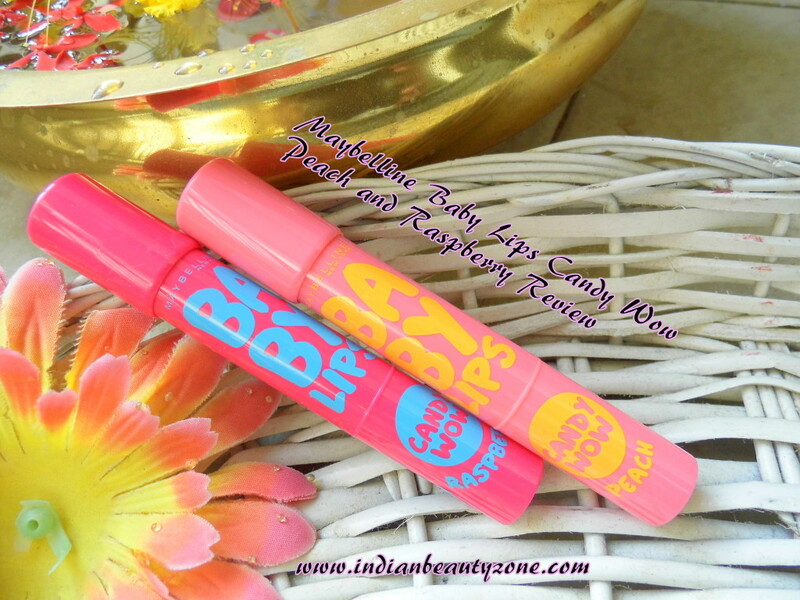 The texture is creamy and smooth and same as baby lips lip balms. 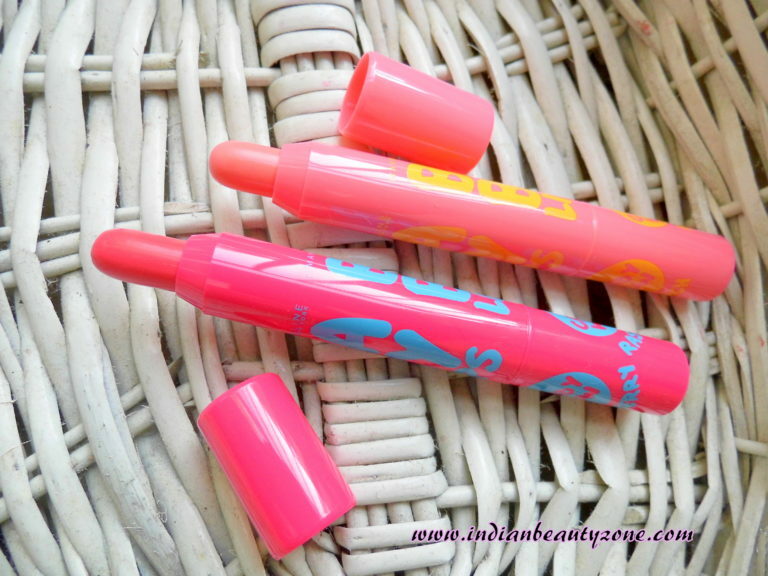 It gives immediate moisture lock to your lips and hydrates them well. When Applied the lips looks luscious an shiny. The pigmentation is more than the baby lips and as a tinted lip balm it is more than a lip balm and less than a lipstick, I mean it comes between a lip balm and a lipstick when compared. There is no doubt I don't like PEACH shade and I like Raspberry more. This shade is best for all Indian skin tone. It is a common pink and looks good on my medium skin tone, I am loving this lip balm currently. 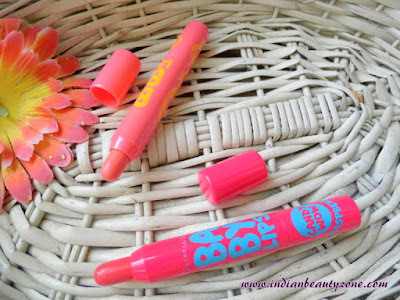 The Candy Wow range from Maybelline is an improved and best form of normal Baby lips lip balm. It stays 3 to 4 hours and later it goes away leaving a light tint on lips. it doesn't feels greasy or heavy on lips but hydrates and moisturizes the lips well. Overall BABY LIPS lovers must try this range. looks like a sheer lipstick. Doesn't feel greasy on lips. Has mild candy smell that fades away soon. Raspberry is a common pink for all skin tones. Staying power could have been more. Pale shades like peach never works on Indian skin tone. Could have been less in price (they can reduce the quantity).